Did you know that the largest royal palace in the world sits just 37 kilometers outside Naples? On the morning of January 20th 1752 the first stone of Caserta Palace was laid for Charles VII of Bourbon, King of Naples and Sicily. The Bourbon King had decided to build the largest palace in all of Europe, a palace to rival the beauty of Paris’ magnificent Versailles, and the Schonbrun palace in Vienna. In an odd twist of fate Charles VII never lived in Caserta, instead abdicating the throne in 1759 to become the king of Spain. 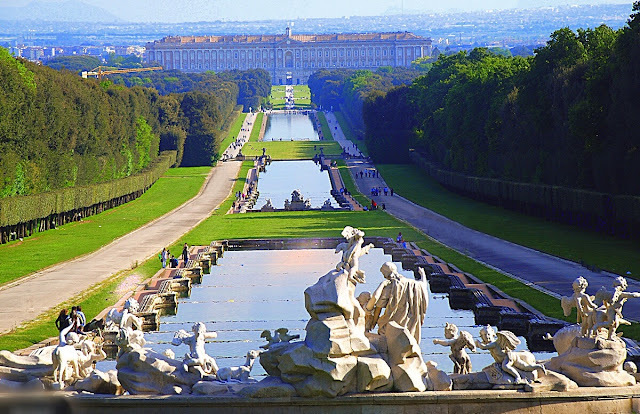 His third born son, Ferdinand IV became king of Naples and Sicily, lived in Caserta, and in 1768 married Maria Carolina of Austria, who grew up in the Schonbrun Palace, and who’s sister Marie Antoinette would marry Louis XVI of France two years later and move to Versailles, the very palace that Caserta was designed to beat. Makes your head spin, non? The Palace of Caserta is massive. It has more than 1200 rooms, stands 42 meters (45 yards) high and 250 meters (273 yards) long, taking up 44,000 square meters. The gardens are 3.5 kilometers long, with a central waterway and 6 fountains, surrounded by a tree filled park. Statues enjoy a break from the sun, tucked away in the shade of the trees. They also line the walkways. And adorn the bridges. The statues are a celebration of the arts. You can take a horse and carriage ride through the grounds, rent a bike, or just stroll. In 1997 Caserta became a UNESCO World heritage site. For years and years I had wanted to go to Caserta but it never fit in with the trips I was on, whether I was private tour guiding or traveling with friends. This past December I was lucky enough to be able to sneak off to Italy for a week, during which I was able to finally go visit the spectacular Palace of Caserta. The palace and the grounds are nothing short of spectacular. No matter how prepared you think you are, once you walk onto the palace grounds the sheer size of Caserta is staggering. In it’s day it must have been magnificent. But basically no one bothers to go see it. You would think the largest royal palace in all of Europe would get great tourist traffic, but Caserta gets around 500, 000 visitors per year compared to Versailles 5 million. Unfortunately Caserta is sorely lacking in funds and as such is a little run down. The palace has been used as a training facility for the Italian Air Force, which along with the Carabinieri still has offices there. Movies including Star Wars, Mission Impossible and Angels and Demons have shot there. Palace security is apparently lacking, and despite the Air Force and the Carabinieri both being in residence there have been problems with theft, most notably recently $100, 000 worth of copper being stolen from a lightening conductor on the roof. There is something incredibly sad about this once majestic palace and it’s enormous gardens. Just the thought of Hollywood descending on it and stomping around disrespectfully all over the grounds and the rooms while they make their movies makes it feel desecrated. And yet because hardly anyone bothers to go visit Caserta it also feels like your best kept secret. Other than my friends who live in the area I don’t even know one person who has been there before. If you are in the Amalfi Coast/Naples area Caserta is well worth a visit. The train station is right outside the palace, so you don’t need to rent a car.